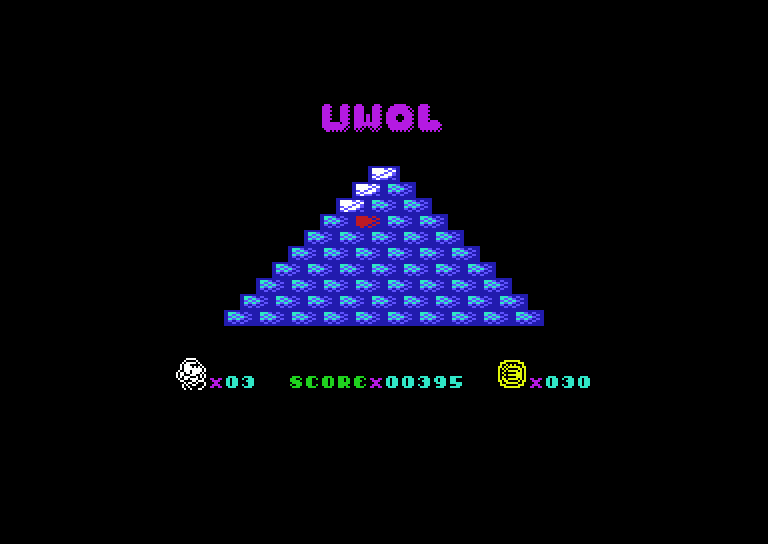 Download UWOL: Quest For Money in .crt cartridge format HERE! 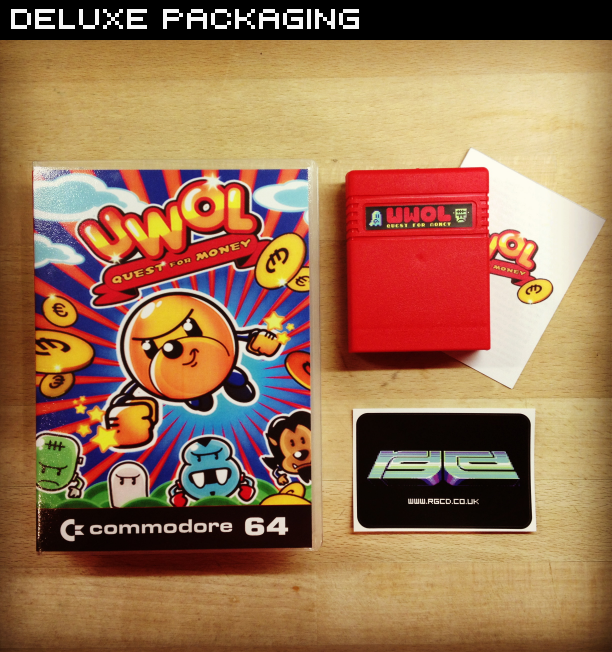 Download UWOL: Quest For Money in .d64 disk format HERE! 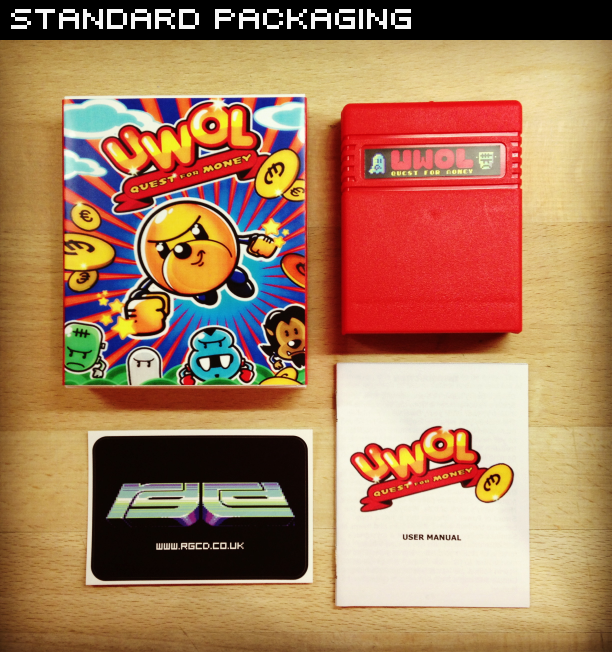 Download UWOL: Quest For Money in .tap tape format HERE! BONUS! 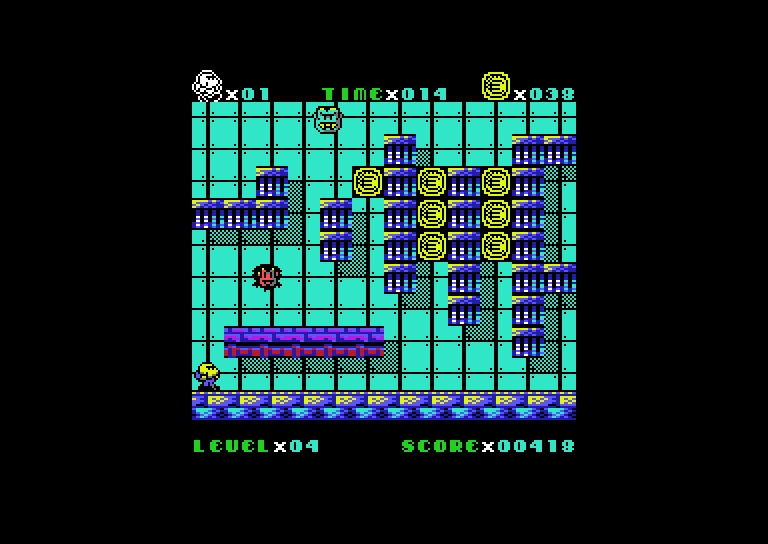 Check out the original ZX Spectrum version HERE! 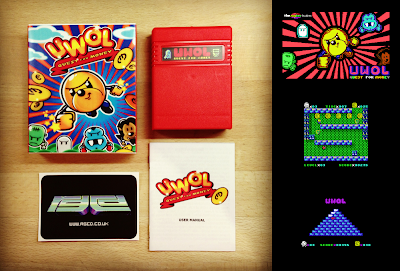 Despite being super rich and earning 90% of Spain's national income from the videogame industry, year after year, Uwol wasn't satisfied. The money just wasn't enough - what he craved more than anything was adventure (in addition to yet more wealth), so he decided to become a treasure hunter and follow in the footsteps of his gaming heroes. After already collecting valuable rewards such as the fire that doesn't burn (which looks great in the hall of his house), the proton pistol and proton charger, three pairs of Gremla's knickers, Miner Willy's book of bills, Wally's pajamas, the Sword of Power (although this is just a copy because the real one is still in use) and heaps of Saimaza coffee, Uwol learns that a mysterious and eccentric millionaire has hidden a huge fortune of stolen gold coins within a deserted manor next to Canutos Forest - the so-called Storm Palace. So he decides to emulate his idol Goodie and begin a new quest... A Quest For Money! However, this quest didn't prove to be easy. The cellar labyrinth of Storm Palace is deep and full of nooks and crannies, and the complex layout of the rooms makes it very easy to get lost. And that's exactly what has happened to poor Uwol; his greed drove him deeper and deeper into the manor until he eventually became lost and trapped in the lowest dungeon, inhabited by Vampy, Franky, Fanty and Wolfy - who are all determined to make his life a misery. It's up to you to guide Uwol out of the maze-like cellars - but make sure you collect enough gold coins to make the adventure worthwhile or Uwol will insist that you start over again! 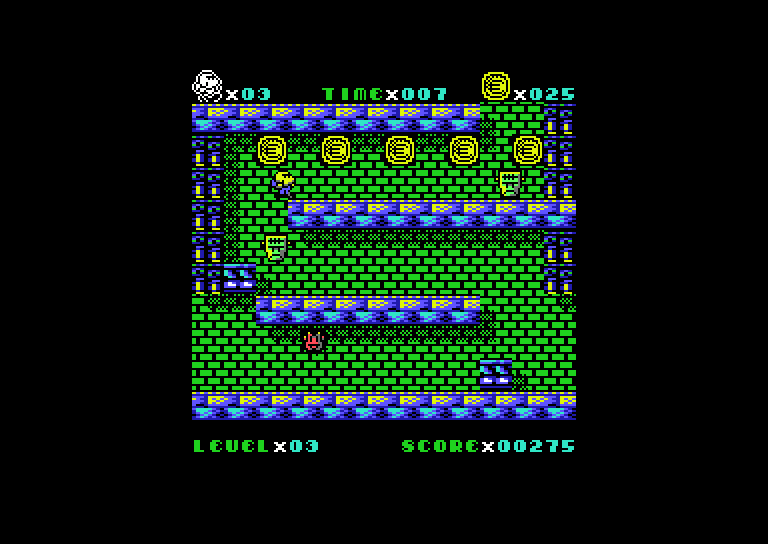 To play the game (downloaded from the links above) you will need either a real C64 (and a method of transferring the files over to it) or an emulator. For emulator users, we recommend VICE, as it works on a variety of systems and is very user friendly. Just download the emulator and drag and drop the .d64/.tap file into the open program window (or attach the .crt image from the file menu). Uwol is controlled via a joystick or joypad plugged into port 2, with LEFT and RIGHT to control movement, FIRE or UP to jump and DOWN to select a level exit. The game is all about stealing gold coins, and Uwol won't want to end his quest until he collects a minimum of 255. The map of Storm Palace's cellar is arranged like a pyramid; starting from the top, when you clear each room of coins you will be given the opportunity to choose which path (left or right) to take. You select a path walking over one of the arrows which appear at the bottom of the level and pressing DOWN. If you reach the bottom of the pyramid but haven't gathered enough coins, Uwol will force you back to the start to take a new route. This time, you should choose another path because the already visited rooms will be empty. Use the pyramid map to see which rooms have been cleared and which are still full of gold. 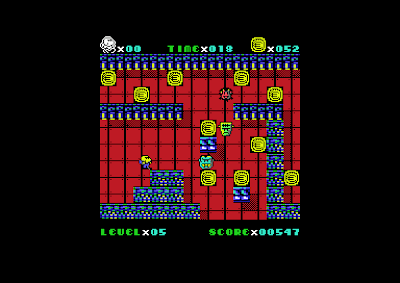 There are three enemies which follow linear paths (Vampy, Franky and Wolfy) but once the in game timer runs out one of them will turn into Fanty, who will chase you relentlessly around the screen. During gameplay, if you touch any of the cellar inhabitants they'll tear off your clothes. 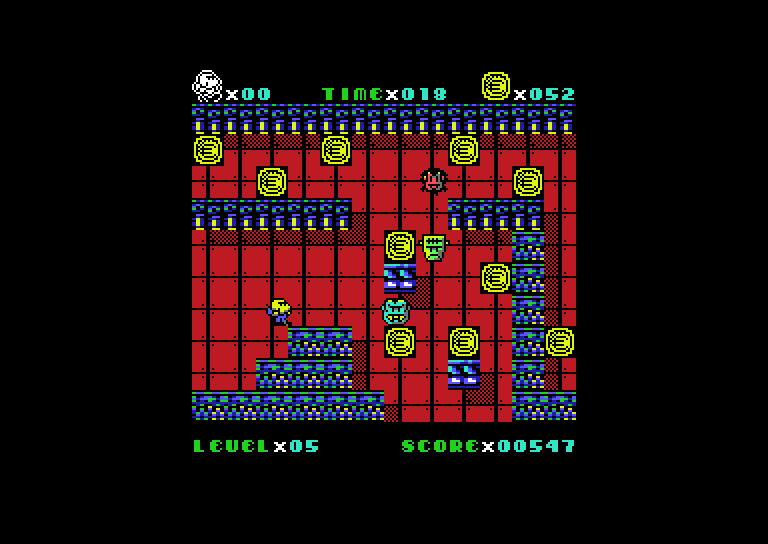 Collect the t-shirt icon that appears to quickly redress yourself, otherwise the next time a monster grabs you it will cost you a life, and you'll have to start the level again! Extra lives are awarded for 1000 and 2500 points. 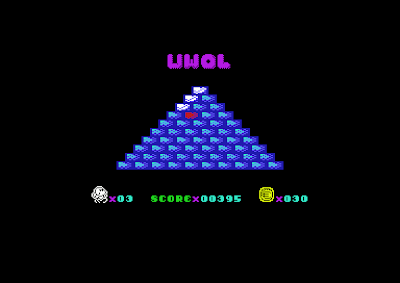 UWOL: Quest for Money has been tested on both PAL and NTSC machines, and works on the C64, C128 and C64GS (there is no keyboard input required to play). Although it runs on NTSC hardware, it does play fractionally faster as a direct result of this. As such, the game is labelled as NTSC compatible, but designed for PAL systems. SID 8580 recommended. Below is a short promotional video recorded using the VICE emulator showing the game being played. 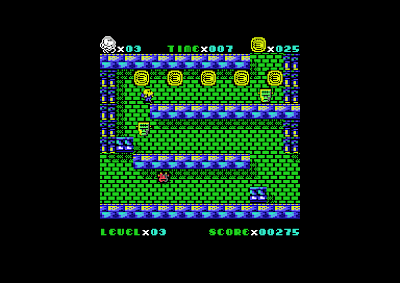 Originally released back in 2010, the C64 port of this superb little platformer by The Mojon Twins has stood the test of time admirably and remains as enjoyable today as was on its initial release. 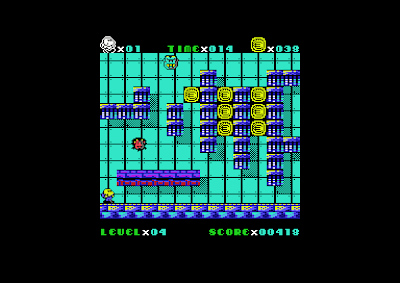 With the ZX Spectrum game designer na_th_an on board, Algarbi rewriting the code and Conrad on soundtrack duties, UWOL's classic arcade design and addictive gameplay translated over to the C64 to create a game that's arguably better than the original - UWOL is more than deserving of its respectable score over at CSDB. RGCD previously featured an article on UWOL and its many ports, including this C64 conversion. UWOL: Quest For Money is a Ubhres/Mojon Twins production, Copyright 2006-2012, published on 64KB C64 cartridge by RGCD, 2012. The cartridge version of UWOL: Quest for Money is available to buy from our shop. The game is presented in a red cartridge shell complete with a printed manual and a vinyl RGCD sticker. The cartridge version is available in two packaging types, a standard card carton and a more expensive 'deluxe version' that comes in a plastic case (a Universal Game Case with a specially cut foam insert to hold the cartridge). The standard version is priced at £22, whereas the deluxe version costs £27. Shipping is £4 for UK/Europe and £5 for the rest of the world.